How many times have you made a New Year’s resolution, only to fail? If you’re anything like me, I get all excited and enthusiastic about the whole “New Year/New Me” vibe and I put tons of energy and enthusiasm into my goal, only to burn out a few weeks into my new routine. I’m always looking to better myself – lose some weight, eat healthier, sleep more, work on a new side gig, and other changes to improve my quality of life. However, the changes are drastic and hard to stick to. So far, my success rate has been a big honkin’ zero. Until, I found a Ted Talk that was extremely helpful. And this year, I decided to do something different with my New Year’s resolutions. BJ Fogg, a researcher at Stanford University did a Ted Talk on what he calls “tiny habits” or little actions that add up to big changes. He explained that people often can’t commit to changes in their routine. We have trouble staying motivated. Um, yes! However, if the changes are tiny enough, we can stick with them. In essence, the actions have to be so small, that it doesn’t take a lot of effort or motivation to accomplish them. For example, he does two push ups every time he uses the restroom. This doesn’t seem like much, but how many times does a person use the bathroom every day? Also, what if you made it three push ups or four instead of two? Doing this every single day adds up to health benefits! By the way, if you’d like to work with this researcher personally, he guides a new group weekly through the process of setting up tiny habits. You can join his group here. With this research in mind, I started looking for “tiny habit” ideas I could incorporate into my daily routine without much effort or motivation. And I came upon a very helpful book. There are a lot of books out there on forming small habits. The one I recommend is Habit Stacking by S.J. Scott. The author gives over a hundred ideas for small changes to your daily routine. Scott recommends adding in a habit or two per week and working your way up to more.The mini habits are broken down into several categories like finances, health, leisure, organizing, relationships, and spirituality. I used some of his suggestions, as well as adding in some of my own. According to the research, you need to tie these habits into small actions you already take, to act as a “trigger” which motivates you to complete the action/habit. For me, I used waking up, eating lunch, and going to bed as my triggers. Scott breaks habits down into three types, like keystone habits, which impact several areas of your life. An example is working out, which can cause you to eat healthier. It might influence your self-esteem, which can spill over to your relationships with other people. Support habits, are aptly named, since they support the keystone ones. For the exercise example, wearing a step tracker, would be a support habit. Elephant habits are long term goals, which take a lot of time and effort to complete. For example, decluttering your house or apartment. This is going to take some serious time, but it will pay off in the long run. Unless, you’re like me, and you follow the Marie Kondo method. I did my entire apartment in two weeks. It was a lot of work and exhausting, both emotionally and physically, but so worth it. By the way, if you have a Kindle Unlimited subscription from Amazon, which is free for the first month, the habits book won’t cost you anything. With this information in mind, I decided to gradually create routines, adding in one habit per week, and creating “habit stacks” or tiny actions that would improve my life. 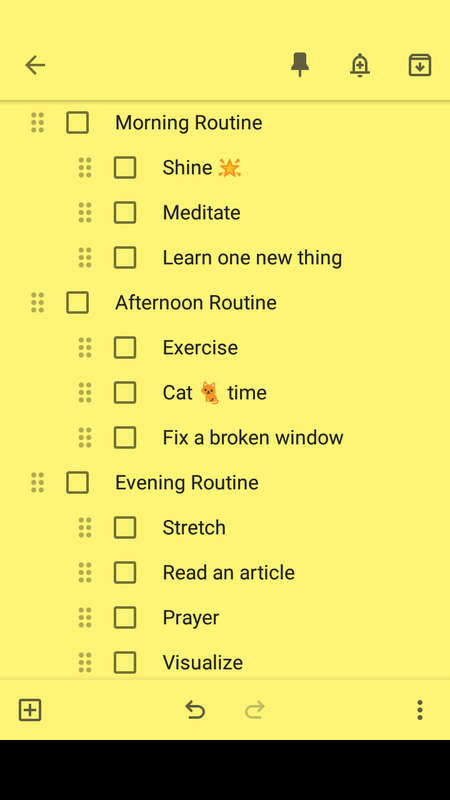 I use Google Keep as a digital reminder/checklist. It’s free, and it’s conveniently located on every device I own. (phone, tablet, desktop, laptop). This is a paid app, but it’s worth every single penny. It’s the first thing I do every morning. I get a positive quote or article, and I “check in” with my mood, identify something I feel grateful for. Then I make a plan to do one thing to make me feel better. For example, I’m grateful for the cozy new blanket I got for my birthday. I love snuggling under it. As a little pick me up, I’m going to watch a fun YouTube video as a break from work today, along with making myself a cup of coffee. The app is an excellent reminder, but you can do all of these actions on your own as well. I take five minutes or more to meditate before I get out of bed every morning. It helps me get centered to start the day. Research has shown in can help with anxiety, sleep, and depression as well. It keeps me centered and focused. You can do this with apps like Calm or Headspace. Right now, I’m really loving a free ASMR channel on YouTube. I’ve also used tarot cards for this purpose. I draw one from the deck and concentrate on it. I am currently attending YouTube University. I’m always looking for new skills or ideas I can use in my own life or my business. Spend an afternoon looking for some helpful channels and then subscribe. There are some great bite-sized nuggets of information available. I also follow several blogs on finances, lifestyle, frugality, and other topics. I use Pocket to collect my articles with their RSS feed and an IFTT formula. The are delivered right to my Kindle device via the app, which makes for easy reading. I do this habit stack before I eat lunch, which serves as my trigger. This has been a big one for me. I hate exercising. Hate it! It’s never been fun for me. I’ve committed to my daily thirty minutes of physical activity several times over the years, and I’ve never been able to stick to it. So, I’ve done a little research. I’ve found that High-Intensity Interval Training, or HIIT for short, is effective. It involves short bursts of activity for a smaller amount of time. Sounds perfect! I’ll take my pain in a shorter amount of time, please. So, I’ve committed to 4-5 minutes of HIIT training every morning. So far, I can tell a difference in my stamina. And the time is so short, I’m motivated to do it. This is a psychological concept that refers to disorder and chaos around you. It is derived from a controversial law enforcement concept about communities where there’s a lot of graffiti, public drunkenness, petty crime, etc. Because of this lawlessness, people will be less likely to obey the laws, according to the theory anyway. In this case, if you are living with annoyances, or things that make you feel overwhelmed, you’ll be less likely to be organized and in control. For me, I identify things that bother me and then “fix” them. I just keep a running list and work on one per day. Some examples are a clogged bathroom sink, a squeak in my desk chair, dirty floorboards, a drippy sink. Each day, I take five minutes to fix a broken window. And it’s made a huge impact on my psychological well-being. I just add it to the list to fix and I don’t have that “ugh” feeling when I come across yet another thing that needs to be dealt with. It’s an excellent way to protect your energy, if you are a practicing witch. I have two cats, and I spend five minutes playing with them. Basically, we run around my apartment, chasing each other. I use a cat teaser and they love it. Or I do some quick grooming. Of course, I pet them, and spend time with them the rest of the day, but this is guaranteed play time/brushing and they’ve come to expect it and look forward to it. I do, too. It’s a great way to break up the afternoon. My trigger for the evening routine is taking a shower, because I do that every single night before bed. This is the way I wind down from the day and get ready for sleep. I do five to ten minutes of stretching to get myself ready for bed. This works on my flexibility, as well as helps me relax. Right now, I’m digging this five minute Warrior Yoga flow sequence. So, I’ve made a list of five goals and I carry it around with me in Google Keep. Every night, I go through my goals and visualize myself accomplishing these. I recently did a free training offered by Mel Robbins on the importance of mindset. Essentially, if you are visualizing yourself and telling yourself that you can do these things, you can and will accomplish them. I do a little prayer before bed, as a way to connect to the universe and something larger than myself. I pray to Artemis, because she is my chosen goddess, but you can pray to anyone you like. It an excellent and intentional way to end the evening. What habits do you currently have? Or what kind of habits do you want to incorporate into your daily routine? Posted in Mindset. Bookmark the permalink.